Detailed bio VK3BUF – The Radio Amateur Society of Australia Inc.
I’m Ian Jackson VK3BUF. For the past 19 years I have been living on a small property wedged between cow pastures at Drouin West, around 100 km due East of Melbourne. Within RASA I hold the position of ‘General Secretary’, which means I get to focus on the longer term aspects of administrative compliance and not so much about day-to-day correspondence. In 1977 I entered the hobby of Amateur Radio as a 16 year old enthusiast. It was the logical progression beyond CB radio at that time when I discovered it was the technical aspects that were the biggest attraction. Back then I joined the Gippsland Gate Radio & Electronics Club in the South Eastern suburbs of Melbourne and have been an active operator since then. In 2004 I was honoured to be made a Life Member of that club. Mostly around the home I use 2M / 70cm and use it to stay in touch with my wife Dianne VK3JDI when one of us is on the road. HF radio is something I tend to indulge in while camping. Originally I got about with my FT101E under the dashboard of my 1966 mini. I still have that rig, but nowadays I do enjoy using the FT950 with all its extra buttons. I think that Amateur Radio works in different ways for different people and that is its strength. I believe it is at its best when travelling a long way from home as a meaningful way to stay in touch with friends. Beyond that, I am still enchanted by the electronics technology that underpins the hobby and I spend a lot of time on the microprocessors and software that is so integral to what we do. For several decades I followed the W.I.A. as Australia’s only representative body for Amateur Radio, as there was no one else doing this important work. In recent years I felt that they had lost focus, treated its volunteers poorly and drifted away from what I believe to be important for the future of the hobby. It had failed to work well with the clubs and operators around the country which keep our hobby alive. When the concept of Australia having a second representative body was floated, I saw it as an opportunity to lift community consultation with clubs and to progress areas that had been sadly neglected. I don’t see RASA as a divisive influence, but rather a healthy competition that will inspire everyone to work harder for the hobby. I had been active in the radio club scene for most of my life and for the past thirty years I have built up a successful company in electronics manufacturing. This has given me a solid grounding in commercial realities. For the past four years I have been active on the Business Advisory Board that serves the local council by providing economic guidance. These experiences have prepared me well for my role in RASA to help safeguard the future of our hobby. 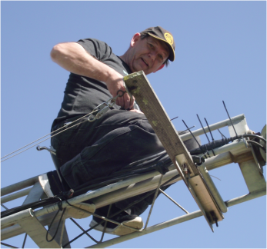 For the past five years I had been one of the organisers of Antennapalooza, an inter-club field weekend that focuses on antennas, field operation and a lot of fun. It has been less than a year since the inception of RASA and I am quite happy with the direction it is taking, its consultative approach and fresh ideas. It appears that hundreds of other Amateurs around the country feel the same way. The management team is working well together and in the same direction, despite the vast distances involved. A very efficient and effective structure has been created and the future looks to be quite positive. Amateur Radio in 2018 is facing several challenges. The point of entry into the hobby is via the examination system, which is both expensive and unfriendly to our candidates. Without compromising technical standards, we desperately need to make the exam process much more friendly and approachable than it is now. Australia has over one hundred radio clubs that do great work, but largely in isolation. Over the next few years I would like to see a shift towards greater coordination and cooperation between these clubs, as they form the backbone of our hobby. If RASA can contribute towards making this happen then only good will come of it. I think that for anyone entering Amateur Radio as a hobby is a bit like taking holidays in a strange country. First have a quick look around at all the different aspects that present themselves, then go back and re-visit the places and themes that interest you, but in much greater detail. Like a fresh holiday destination, Amateur Radio has a lot to see and there’s always something to hold your interest when you look more closely at it. Boredom is not an option.